On this page you can find explanation about (n-)cubic interpolation and implementations in Java and C++. Anything at this page may be copied and modified. Please contact me if you find an error. If the values of a function f(x) and its derivative are known at x=0 and x=1, then the function can be interpolated on the interval [0,1] using a third degree polynomial. This is called cubic interpolation. The formula of this polynomial can be easily derived. And there we have our cubic interpolation formula. Interpolation is often used to interpolate between a list of values. In that case we don't know the derivative of the function. We could simply use derivative 0 at every point, but we obtain smoother curves when we use the slope of a line between the previous and the next point as the derivative at a point. In that case the resulting polynomial is called a Catmull-Rom spline. Suppose you have the values p0, p1, p2 and p3 at respectively x=-1, x=0, x=1, and x=2. Then we can assign the values of f(0), f(1), f'(0) and f'(1) using the formulas below to interpolate between p1 and p2. Repeat the first and the last point. Let the end point be in the middle of a line between the imaginary point and the point next to the end point. 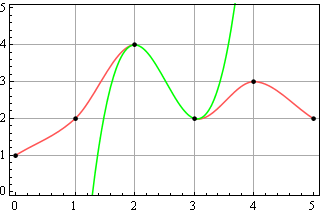 Bicubic interpolation is cubic interpolation in two dimensions. I'll only consider the case where we want to interpolate a two dimensional grid. We can use the cubic interpolation formula to construct the bicubic interpolation formula. Bicubic interpolation can be used to resize images. However, this is (currently) out of the scope of this article. Please don't ask me questions about that. This section provides an alternative way to calculate bicubic interpolation. For most purposes this way is probably less practical and efficient than the way it is done above. This implementation can run faster than the implementation above when getValue is called multiple times for one call to updateCoefficients. Similar implementations could be written for other dimensions than two.